Low profile rocker sole. The lab-designed rocker sole, enables a normal walking gait with less forefoot angulations and reduces hyperextension of the knee. Toe-off section continues the rocking motion, enhancing mobility. Mid-stance section is designed to minimize hip differential. What calf size does the boot fit? I have very large calf's and worried it would not fit. 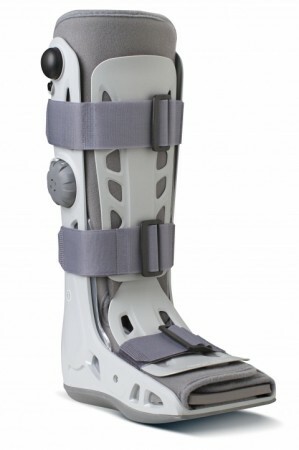 The airselect boot can be cut at the calf area, to allow for expanding the boot width around the calf area. Additionally based on shoe size, the overall calf size also increases per size of boot. Can you purchase just the dial for this boot? my daughter has this and the dial fell off. Thank you for your question. The dial is not a replaceable part. The product does have a 6 month warranty. If you received the product within the last 6 months you can have it replaces at the office you received it from, or better braces.com if it was purchased off this site. You can call the customer service line if your physician is unable to assist 800-336-6596. How can you tell how much air to put in the boot? If I'm suppose to keep my foot elevated, should i let the air out while resting? How do I pump air into da parts dat need 2 be filled up? Xo I need a special pump?? Or does it bring its own pump.. The pump is on the side of the brace as well as a dial with 2 numbers on it. You tun the dial to the either 1 for the #1 air bladder and use the black pump on the side to inflate. Then turn dial to 2 for the second air bladder. How much does this cast weigh? How does this cast differ from the Elite?